forums.silverfrost.com :: View topic - AVX512 makes killing speed? Posted: Sun Nov 11, 2018 10:35 am Post subject: AVX512 makes killing speed? There was new 9th gen Intel processor i9-9900k tested on Anandtech recently reaching 5GHz. One of scientifically oriented tests on 3D particle movement I found produces very unusual result. There the older 7th gen processors reached 4-5x the speed of this new Intel and AMD incarnations despite of all of them were using AVX. It is easy to draw incorrect conclusions from such benchmarks. In particular, did all the results come from PCs that were identical in all respects (including air temperature, fan speed, etc.) except the CPU model? What part of the benchmark code is able to benefit from AVX512? The i9-7980XE does have AVX512 (2 units, in fact). Who would pay $1,700 for a chip that did not have better capabilities than a $200 chip (such as an i5-8400)? There was an interesting thread in the Intel Fortran forum, where one of the senior members benchmarked changing the text of the King James Version of the Bible, all 4.5 MB of it, to uppercase from normal mixed case. He presented AVX code that did the conversion 500 times faster than a routine table look up (a->A, b->B, etc. ), on the same AVX-capable CPU. Without the right software, simply buying a hot new CPU may not give spectacular performance. Is this what FTN95 doing in one single line of Fortran text? Silverfrost may look at these 2 pages of assembler code posted there to speed it up. Is it worth asking Repeat Offender to look at linear algebra for AVX512 processors? 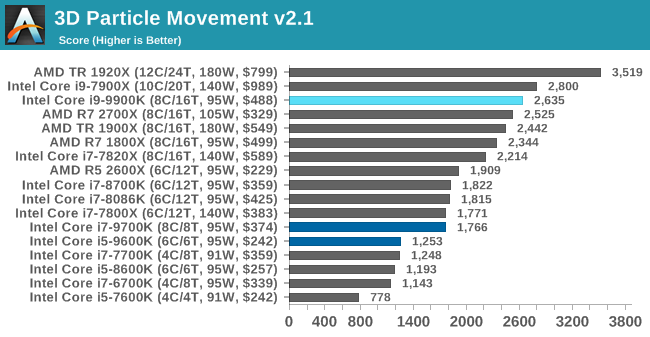 Or just at that Anandtech benchmark, may be this speedup was not due to AVX512. Have anyone reported benefits of it with Intel linear algebra packages? [quote="DanRRight"]Is this what FTN95 doing in one single line of Fortran text? for R.O. 's AVX routine. Since FTN95 does not support opening a file with ACCESS='STREAM', you would have to read/convert/write one line at a time, or write code to use unformatted I/O to prcess the whole text in one gulp. R.O. 's UPCASE with one gulp is about a thousand times faster than FTN95 /64 /opt with one-line-at a time processing. Have anyone reported benefits of it with Intel linear algebra packages? AVX512 is not available on desktop processors, as far as I know. However, see https://software.intel.com/en-us/forums/intel-math-kernel-library/topic/796407 . Ones i used assembler routines with FTN95, but then one day they became useless when we switched to new compiler version. Indeed, there was no demand to speedup this function, i used it to convert just a few letters, but may be there would be something useful here at least for marketing purposes if implementing this would not take time. As to these specific AVX512 processors, there is nothing negative with them versus our usual desktop ones. Leaving the ones with very high core count >12-16 aside, the prices per core are similar, max clocks too, motherboards accept high end videocards, they even can play games not any slower etc. They just consume a bit more, mostly with AVX on. But there exist also huge advantages versus standard desktop ones: they have 4 memory channels and potentially can double memory bandwidth for linear algebra calculations. And they should have much larger limitations on maximum addressable RAM then 64GB being future proof. BTW, the RO's two pages of assembler text is not the elegant one line call but two pages of totally incomprehensible nonsense for all 100% fortraners minus a few. You do "fasm upcase.asm" and add the OBJ that is produced to your Fortran runtime library. Now RO's upcase is a one-liner. APL lives on; Arthur Whitney's Kdb+ is based on a derivative of APL, and is used on Wall Street, see http://code.kx.com/q/about/kxtechnology/ . I don't know which processors support AVX512. Apparently Intel are now providing this in their i9-7900X. AVX instructions are a good way to improve performance, if the compiler supports these instructions. The charts don't identify the type of calculation, but to get this improvement you need most calculations to take place with data in the thread's cache. AVX512 would require a high memory transmission bandwidth, especially if combined with 20 threads. You also need a suitable algorithm ! Linear algebra packages for dense or sparse matrix Ax=B solvers would need cache smart strategies to utilise the 512 instructions and the many threads; both of which are difficult with these types of problems. Moving to more threads also has the problem of achieving load balancing between threads, which is a problem in direct solvers. Iterative solvers that work on localised data may be more suitable, but this is not my field. 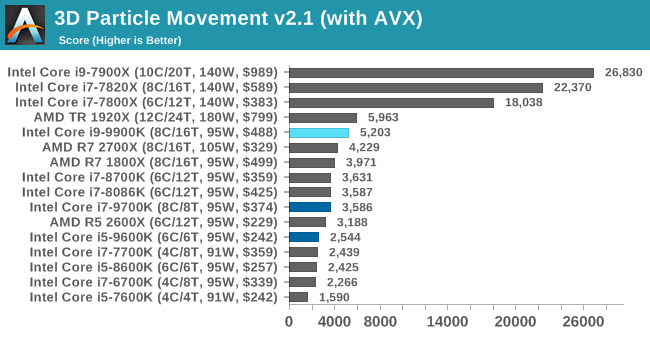 I would expect that most general codes would struggle to show these published improvements when changing from AVX or AVX2 to AVX512 instructions. I notice some other benchmarks don't show the same improvement; it depends on the test example.